Daylight Saving Time is a bizarre moment when we change the clocks and confuse everybody. In the fall we set the clocks back an hour (“fall back”), and in the spring we set the clocks ahead an hour (“spring forward”). Somehow this gives us more daylight to work with, but few people can explain how or why (or if) it works. But all this time changing can mean people miss church. So it’s always helpful to remind your congregation about Daylight Saving Time. We’ve got a free resource that explores why it’s necessary, how to communicate with your congregation, and shares some ready-made social media posts. 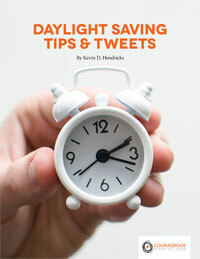 Download Daylight Saving Tips & Tweets now. OK, so not everybody thinks it’s a good idea. There’s been some debate recently about how churches should respond to Daylight Saving Time—or even if they should respond. Some argue that modern technology does the time changing for us, so nobody needs a reminder. Others shrug at the idea of worrying about someone showing up early to church. Smartphones and other intelligent devices are nearly ubiquitous these days, making the annual spring forward and fall back happen automatically. The actual time change mostly happens automatically, but that’s not why we remind people. We remind people about Daylight Saving Time so they can prepare themselves for the shift. Daylight Saving Time is an opportunity for the church to be helpful. Why wouldn’t you want to be helpful? It’s an opportunity for your church to be welcoming and gracious. If you need more help with Daylight Savings Time, our Courageous Storytellers membership site has ready-made social media graphics you can use. Yes, everyone wants to be helpful- but this isn’t helpful. People don’t miss church because they forget DST- they miss church because they’re tired and DST feels like a good excuse not to go. The more you say to your congregation, the less they hear. “Reminding” them about DST is a waste of your voice.